Through many years of teaching and writing about finishing, I’ve found myself repeating certain phrases — or what I call rules — over and over. They are rules because they are almost always true. Here are nine of my favorites. 1. There are only three tools used to apply finishes: rag, brush and spray gun. All three are simple to use. Even a spray gun is no more complicated to use than a router. A rag is a cheap and efficient tool for applying a stain or finish that you intend to wipe off, but rags don’t work well when you’re trying to build a film because there’s no good way to prevent ridges and troughs. A brush is the slowest of the three tools for applying stains and finishes, but it is also the least wasteful. A spray gun is fast and applies the most level film. But spray guns are the most expensive tools and, because of bounce-back and overspray, they are wasteful of finish material and require an exhaust system for the best results. This short overview of the three tools should make it clear how much finishing differs from woodworking. Woodworking is mostly about mastering a large number of tools whereas finishing is mostly about mastering the use of a large number of products. 2. When sanding wood or finish, choose a sandpaper grit that removes the problem efficiently without creating larger-than-necessary scratches. This means different grits for different situations. For example, you might choose 80- or 100-grit to remove washboarding caused by a jointer or planer, but 120- or 150-grit might work best for veneered plywood or MDF because it has already been sanded at the factory. Likewise, you would choose a coarser grit (say 220) to remove the raised grain from a first coat of water-based finish and a finer grit (say 280 or 320) to smooth lacquer sanding sealer or remove dust nibs. 3. Apply a wet coat of stain and wipe off the excess before it dries. This is the basic instruction for applying all stains. The exception is when you spray the stain and leave it as sprayed. Stains designed for spraying and leaving are sometimes called no-wipe or spray-to-color stains. They are distinguished from wiping stains by being thinned a great deal so they are easier to control without lap marks and darker areas on complex objects. The reason some stains color wood darker than others even when all the excess is wiped off is that they contain a higher ratio of colorant (pigment or dye) to liquid (binder and thinner). You can get any stain to color a little darker by leaving it wet on the wood for a few minutes. As the thinner evaporates, the ratio of colorant to liquid increases. You can also apply a second coat after the first has dried. 4. Dye dissolves, pigment suspends and settles. Dye, therefore, penetrates into the wood everywhere the liquid does. But pigment only lodges in pores and sanding scratches large enough to hold it. This difference is responsible for the different effects that you get from these two colorants. Dye colors wood more evenly and thoroughly than pigment. Pigment highlights grain better. Many commercial stains contain both dye and pigment, together with a binder. Dye dissolved in a liquid with no binder has the potential to make wood very dark, even black by increasing the dye-to-liquid ratio or by applying several coats. Unlike stains with a binder, dye stains with no binder don’t build. Keep in mind that dye also fades much quicker than pigment. 5. The only thing you can do in finishing that can’t be easily fixed is to blotch the wood with a stain. All other problems can be fixed, with the worst case being that you have to strip off the finish and begin again. To fix blotching, you have to sand, scrape or plane the wood to below where the stain has penetrated or hide the blotching with glaze or paint, both of which radically change the appearance. 6. The first coat of any finish seals the wood; all additional coats are topcoats. Products sold or promoted as sealers don’t seal the wood any better than the finish itself. They solve a problem. Sanding sealers make sanding easier, so they are often used to speed production. Sanding sealers and vinyl sealers provide better holdout. They partially fill the pores, so they are used to produce a more level finish. 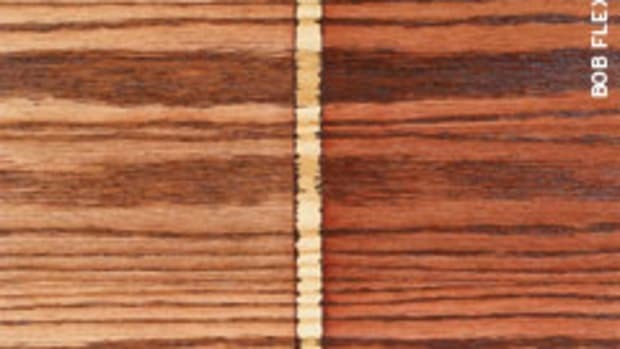 Shellac acts as a barrier against oil, resin or wax in the wood, which can interfere with the flow out and drying of the finish. So-called self-sealing finishes are just finishes that are a little easier to sand. Following this definition of sealing, it should be clear that it doesn’t make sense to say you applied two sealer coats. If you apply two coats of sanding sealer, for example, you are actually applying a sealer coat of sanding sealer and a first topcoat of sanding sealer. 7. The thinner you make any finishing product, the easier it is to apply and the better it levels. Thinning a product is the solution for the most common application problems — brush marks, orange peel and air bubbles drying in the finish. But thinning reduces the film build, which might result in your having to apply an extra coat or two of finish. 8. An old finished or painted surface should be clean and dull for successful recoating. If there is grease or dirt on the surface, or if the surface is glossy, a fresh coat of paint or finish might not bond well. But if an old surface is clean and dull, any new paint or finish should bond fairly well. To clean, wash dirt and sugary spills with soap and water. Wash grease and wax with a solvent such as mineral spirits or naphtha. Dull glossy surfaces with an abrasive such as steel wool, sandpaper or an abrasive pad. With many finishes you can accomplish both in one step by washing with household ammonia or tri-sodium phosphate and water. Commercially available degreasers can also work depending on what solvents are included. 9. Pull the trigger and keep the gun moving. This is the basic rule for using a spray gun. OK, it’s really a little more complicated than this. The spray gun should be clean and adjusted optimally for the object you’re spraying, you need to overlap strokes on large flat surfaces, etc. But I use this rule especially with beginners to simplify spraying so they aren’t afraid to try. The point is that there’s not much hand-eye coordination involved.